Why a hosepipe ban in England’s wettest region? Six months ago parts of north-west England flooded and residents waded knee-deep in muddy water. Now, heading into high summer, a hosepipe ban looms. So why is it suddenly so dry? Sunday is set to be the hottest day so far this year and temperatures may hit 30C, the BBC weather centre predicts. The previous high for 2010 was on 24 May – 28.8C at Heathrow. The prediction comes as millions are set to watch England in the World Cup, tennis fans flock to Wimbledon and Glastonbury festival-goers bask in the sun. Yet another day of low to mid-90s throughout the Southeast, once that pot begins to boil, usually around noon or 1pm then you see those cumulus clouds grow into thunderstorm clouds, as usual, theae will be hit-or-miss I’m affraid, so cooling will be for the lucky few as they get rainfall and the cooling from that rain and cloud. Points to the west and southwest, say from Biloxi, through New Orleans and up towards Shreveport and Dallas, storm chances or low and the likelyhood of seeing anything other than mostly sunny skies is low. Areas from Montgomery to Atlanta and then southeast down into Florida, you guys have a chance at storms this afternoon but who gets those storms is anyones guess… it’s your typical summertime pattern. Mark’s City-Cast as follows: New Orleans, La, Hi 94 (DP around low mid-70s), Lo 79-81 (sunny), Atlanta, Ga, Hi 93 (DP low 70s), Lo 74 (PM storm possible), Charlotte, NC, Hi 95 (DP low to mid-70s), Lo 76 (PM storm possible). Tampa, Fl, Hi 95 (DP mid-70s), Lo 80 (PM storm). A large area of showers and thunderstorms will dominate the Northern tier from N. Dakota to the Ohio Valley. A stationary front will be hoist to storms riding along east to west forcing most spots from Kansas on northward to see at least showers and possibly thunderstorms today, some of which could be very heavy and long-lasting. Highs are generally in the low 80s from N. Dakota to to central and southern Minnesota and Wisconsin, Chicago will see slightly warmer temps with upper 80s but the storm threat is there too. Where it likely won’t rain will be a corridor from Denver to St Louis on south and east where highs will likely top the upper 90s, another hot day for St Louis. Mark’s City-Cast as follows: Bismarck, ND, Hi 83, Lo 60 (showers), Minneapolis, MN, Hi 83, Lo 66 (showers & t-storms likely), Chicago, Il, Hi 88, Lo 70 (PM t-storms), St Louis, Mo, Hi 98, Lo 78 (mostly sunny). A sunnier and therefore hotter day will be on tap throughout Texas and Oklahoma with highs ranging from low to mid-90s for Houston and mid to upper 90s for north, central and west Texas. Lows range from around 80 at Galveston down to Corpus, mid-70s for Houston to San Antonio and mid to upper 70s for Dallas.. Oklahoma City to Tulsa may see a stray afternoon storm, holding the heat back to around 91-94 degrees there today. A typical hot and sunny day for the Southwest with highs slightly lower than the previous few days with highs near but slightly below 110 for many areas odf the desert. For Vegas it will be right around 100 for today there. AM fog and cloud for the beaches and LA, PM sunshine and spotty clouds but highs will be lower with comfortable mid-70s for downtown LA. Lows tonight range from upper 50s in the coolest coastal spots, low 60s for LA and coastal valleys and canyons. Generally low to mid-70s for the deserts with around 80-degree lows for the heart of Las Vegas and Phoenix. Sunny day for the region with highs ranging from 72 in Seattle to 88 in Portland, east of the mountains it may top 90. Tonight lows range from 60 in Seattle, 65 in Portland and 65-70 east of mountains..
ALEX NOW BORN, BUT WHERE WILL HE GO? 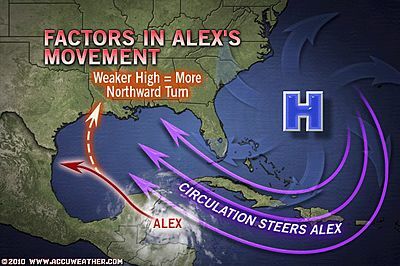 Alex, now named and now impacting Belize and will cross Mexico’s Yucatan, likely weakening before pushing into the western Gulf, where he goes from there remains to be seen. At this point I am in the thinking that northern Mexico will be the target of a Category 1 hurricane sometime Tuesday or Wednesday. Waters ceratinly to 50 feet below the surface is in the 82-85 degree range and with literally no wind shear, there is no reason that Alex can’t regain intensity after it departs the Yucatan. Lets just see whether it wants to take a more northerly turn towards the US. WHILST UK TO HIT 86 DEGREE TOMORROW, WASHINGTON AIMS AT ANOTHER 100. After a dull but warm and humid day here in Lennoxtown where the high topped 74 degrees. Southern England warmed to a very warm 84 degrees today but I strongly am in the camp that somewhere in the south-central portion of England will touch 86 to 90 degrees on Sunday. We have in fact already touched the warmest of the year so far today by a marginal half a degree but tomorrow should clear the “marginal” and have many folks unuded to very warm weather, sweating! Here I anticipate mid-70s but if we manage to see good spells of sunshine we may top the year’s highest so far at my house of a mere 76 degrees! We are still concerned,again, with the erratic behaviour of the seasonal trough, the Monsoon axis. This trough is currently north of its normal position. It has been so, and concern for the same has been regularly mentioned in previous blogs.This position allows westerlies to flow south of the trough. Meanwhile, a W.D.is again moving thru north-west India, bringing partly cloudy sky conditions and isolated thunderstorms.With this, at least the severe heat wave is a thing of the past for now,though days are still slightly above normal. The low-pressure area off Orissa coast moved inland and is now an Upper air Circulation. Hovering over Madhya Pradesh and adjoining areas, it may precipitate pockets of heavy rains in parts of M.P.and Chattisgarh Monday thru Thursday. I do not see any international model showing formation of a low, or any system in the bay till 2nd. July. and without this, a major thrust of monsoon rains in the peninsula regions will be absent. This will leave the lone off shore trough along the west coast to hang on, which will result in some ‘decent rains” along the west coast. Due to lack of suitable “waves”,I surely see the east coast, south of Orissa, totally dry till Friday next(2nd. July). A monsoon progress into Gujarat and M.P.could be ruled out till the 2nd. at least. Delhi, could get the isolated thunder squall produced by the moving W.D. Today’s (Saturday) rainfall map shows very isolated, un-monsoon like rainfall. The rainfall regions could be “hand-picked”. The west coast, due to the trough, the eastern sector in patches, due to the UAC, and few regions in the north, due to the W.D. No widespread rains seen anywhere. Mumbai, like I said, will get diminshed rainfall over the weekend, maybe 5-10mms/day. Some quantum increase in rains, to about 35 mms/day, could be expected on Tuesday and Wednesday, due to the off shore trough lingering on. Mumbai may be rejoicing with the very heaavy rainfall recieved this June,but,as mentioned, the rains are very sporadic, and though Colaba recieved an extremely good amount of 920 mms, Santa Cruz totalled only 650mms. and where it matters the most, the lakes,the rains were measely in comparison. The highest amongst the lakes to get the rains is Bhatsa, with 492 mms,Tansa recieved 263 mms, Vaitarna 236mms and upper Vaitarna 231mms. Not really impressive, these figures ! Check out our Partner’s Blog, Here! TODAY’S NOTE: Today’s 83 degree high at Charlwood (Greater London) was 2nd warmest of 2010, just shy of Heathrow’s 84-degree high back in May. A generally cloudy day, feeling muggy with low to mid-70s, making it feel summerlike. Skies did display thundery looks during the afternoon as the surface air warmed into the 70s and humidity built. Nothing came of it in this area and the day ended with a pleasently warm evening.